Lake Harriet Kite Festival - January 26th! - Minnesota Kite Society - Fly With Us! 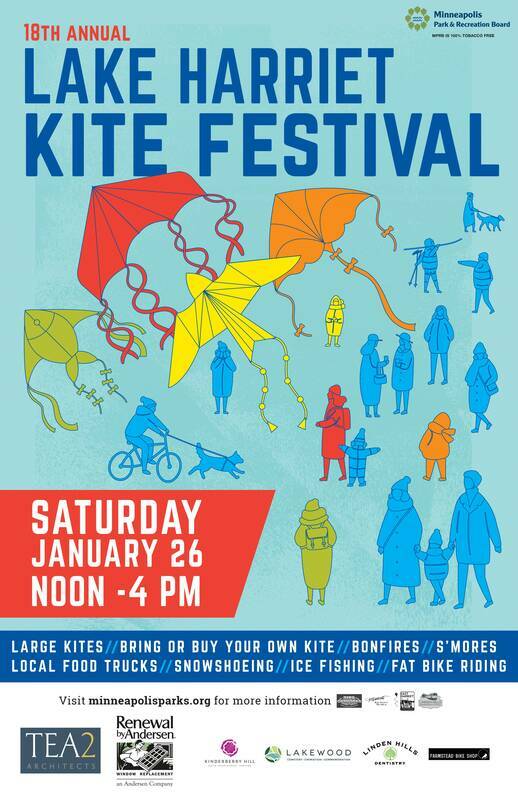 Lake Harriet Kite Festival - January 26th! Tips Outdoors will teach kids ice fishing skills and safety tips. Equipment and permits for children will be provided. New this year - There will be a heated tent with entertainment! Minnesota Kite Society experts will be on hand to demonstrate maneuvering spectacular kites throughout the day, offering their expertise to kite flying enthusiasts and to those who are new to the pastime. Bring your own kite, or buy one at the lake to support the East Harriet Farmstead Neighborhood Association (EHFNA). Art Shanty is coming out of hibernation this winter for just one day to celebrate the Lake Harriet Kite Festival and Art Shanty Projects' return to Lake Harriet in 2020, featuring art shanty performances, activities and art. KiteFest made the City Pages Top 50 Things To Do in Minneapolis Before You Die! #37 Check it out here! Held at the north end of Lake Harriet near the Bandshell, free lot parking is available on site. Please keep in mind lots fill quickly; however, free on-street parking is available throughout the neighborhood. West Lake Harriet Parkway delays are expected. Allow ample time to find a spot and walk to the venue.